It is no longer bizarre that death, as Christopher Pike once said, never comes at the right and expected time, despite what mortals believe. Rather, it always comes like a thief. 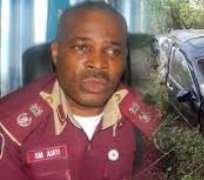 This aged-long maxim has again attained a vindication, given the recent news of one of Nigeria's most vilified deaths in 2018 - the death of the Anambra State Sector Commander, Federal Road Safety Corps, Mr. Sunday Michael Ajayi in a road accident. This is unarguably not quite far from similar hideous situations where a Medical Director is murdered by malaria or where an EFCC Boss is swindled of his lifetime assets by Yahoo Boys. Indeed, a worst form of death is one which the victim used his lifetime to fight against, even for his lifetime enemy. And this is the type of death that has truncated Ajayi's life journey Nigerian road accident has been a recurring situation and one of the most life-truncating shortcuts that has swallowed up innocent lives of many Nigerian. It is in a bid to be an elixir to this life-threatening challenge which sleeps and wakes up with human heads on daily basis, that patriotic men like Sunday Michael Ajayi joined the Federal Road Safety Corps. Ever since Ajayi joined the Corps, he did not only shown unremitting efforts and commitment in promoting safety of the road users, but also recorded some rare but great feats in the discharge of his duties and in helping the Corps achieve its prime goal of reduced road mishaps, which welcomed his promotion to the post of a Sector Commander in the corps. Sunday Michael Ajayi who was born in Ekiti Local Government Area of Kwara State, over fifty years ago joined the corps in his early age with the prime intent to serve his father land and save the public from the risks and dangers of road mishaps. Earlier before being posted to Anambra State as a Sector Commander, Mr. Ajayi served in the Federal Capital Territory, Abuja command as the Head of Operation and Ondo State command as the Head of Operation, each of where he recorded humongous achievements. In 2014, Ajayi was posted to Anambra State as the State's Sector Commander, replacing the former, Mr. Hyginus Uchenna Omeje who was then redeployed to Lagos State. Within a couple of years he rooted in, the safety guru had recorded great achievements in the state, ranging from building public confidence in the Corps, to safety education and innovations that have helped avert many road mishaps and perils. In fact, all Ajayi's effort was focused on promoting safety of the motoring public and other road users whose lives are surrounded by road dangers and risks on daily basis. He never wished anybody's blood should spill on the highways, not even that of his enemies or the reckless drivers; and this he initiated several measures to achieve. Among all these laudable and cynosural feats accomplished by the dexterous commander, he championed several safety campaigns as FRSC commander in Anambra State and brought to its lowest rate, the incidence of road mishaps in the state since the history of the state. In a bid to minimize the road accidents in this yuletide period, Ajayi had launched various measures and flagged off safety campaigns in different cities across the state. The last of these flag offs was the one he championed at Nnewi on Friday 14th December, after he participated in the 2018 FRSC Football Competition, which took place that same day at the Anambra Broadcasting Service (ABS), Awka where he also handed over prizes to the players and the winning teams in the competition. Shockingly, and as nature may have it, the following day (Saturday, 15th December) after these two official appearances, Ajayi, who had devoted all his lifetime in waging war against road accident ruefully lost his dear life in road accident in Asaba, Delta State, on his way coming back from his home state, Kwara, where he attended arelative's wedding. This indeed could be rated as one of the most deplorable and pathetic deaths in 2018, as it has continued to elicit condemnations, lamentations and tributes from concerned Nigerians who were individually marvelled to the marrow on hearing the ugly news. Reacting to the death which he termed 'a heavy blow to the state', the Executive Governor of Anambra State, Chief Dr. Willie Obiano described Mr. Ajayi as a "hard-working and a gentleman who was passionate about his job, gave his country his very best and left an indelible mark in the state with his palpable enthusiasm and commitment to duty." Mr Dele Momodu, the Director of NDLEA in Anambra: “My Almighty Allah grant your soul eternal rest and give fortitude to your family to bear the loss’’ Mr Kehinde Aremu, Director, NYSC in Anambra: “You were an amiable friend of NYSC, we love you but God loves you more, goodnight Sunday" Dr Nkwachukwu Orji, Resident Commissioner of INEC in Anambra: “We will miss you, your death is a collective loss to us, God will console your family, colleagues and friend"
Dr Dave Ugonna, Chairman of Heads of Federal Establishments and Parastatals Forum in Anambra: “You were such a good, dedicated, disciplined, humble and tactful officer, and your tenure in Anambra as Sector Commander earned a new face in road safety management. We will surely miss you." Mr Kehinde Adeleye, Zonal Commanding Officer (ZCO), RS5 Benin: “Ajayi was a reliable officer who upheld the ethics and principles of the Corps while alive. We are sad, we are in deep pain, even the Corps Marshall is mourning. I cannot question God. His death is indeed a bigloss"
He Facilitated the creation of additional three unit commands in the state. Took Road Safety Education and and Advocacy to every nook and cranny of the state. Strengthened operational synergy amongst various security and lawenforcement agencies in the state.Built friendship between FRSC and motoring public/road users. Secured the State Government's belief and confidence in Road Traffic and Safety Management. Introduced several innovative safety measures and tips in the state. Launched and championed various safety campaigns in the state, among others. As the haphazard finger of Mr. death may have chosen, Ajayi, whose car was said to had been hit from behind by another bus, was pronounced dead in hospital where he was rushed, and his driver, a senior Marshall, Mr. Raji who was also rushed to the same hospital was said to have sustained few injuries, and was then receiving treatment. This highly vilified form of death indeed presents an irony of life, in which what one used his lifetime to prevent (even for his lifetime enemies) eventually hit and axed off his own life in a more lamentable way. Notwithstanding how rueful and shocking this may be and whatever sorrow this may have posed, Ajayi's death is a message to the living, and has both didactic and demanding pages that came with it. Only the wise would understand and utilize the message while the others would assume it was merely a passage. However, in every reaction, the most wishful prayer of every well-meaning mortal for this great hero should be: "May the soul of Sunday Michael Ajayi repose peacefully in the bossom of the Almighty, Amen". Izunna Okafor is a Nigerian-based journalist, essayist, Novelist and Poet. He writes from Awka, Anambra State.